How Do I Add Products To A Sale? Running a sale is a great way to bringing in more customers, or even clearing out old inventory, and with Create it couldn't be easier. In order to add products to a sale, you will need to first create the sale. You will now need to set up your "Rules", these "Rules" will then be applied to any products you select. Click "Add Rule" and then follow the instructions to add. 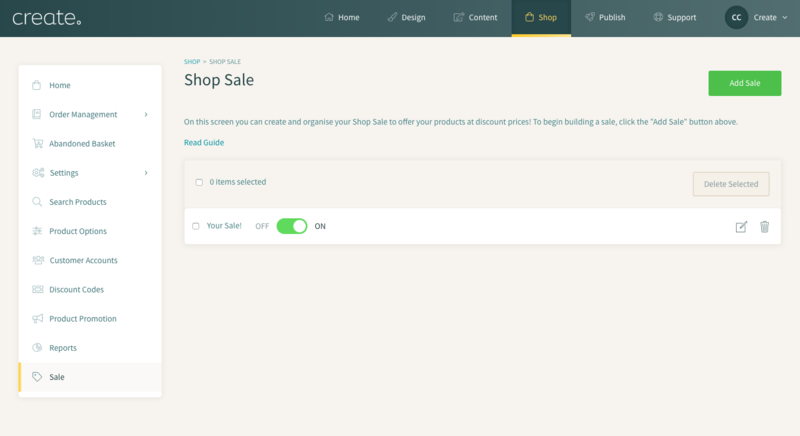 Click "Save Changes" if you have finished setting up your sale or click "Add Rule" to add another type of sale. Your sale is now on hold and you will need to turn it on for it to appear on your live site. To do this click the button next to the rule into the 'ON' position. The green "running" text should appear indicating that your sale is now live.